Rivva Karpany Debuts as a Senior Lion! Small forward Rivva Karpany is the latest Coburg Lion to make his Senior VFL debut, playing in last Saturday’s squad against Werribee after working hard in the Development League. 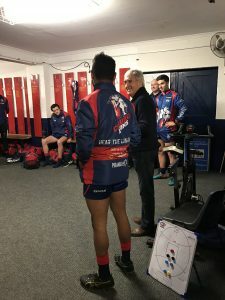 In his first year at Coburg Football Club, the 173-cm, 76-kg, 22-year-old was a regular addition to the Development side, only taking him eight games to make his Senior debut. “I couldn’t describe the feeling,” Karpany said after being asked what it was like to be told the news. “It felt amazing that I was given the opportunity to play Senior VFL footy.” He continued. Recording 13 disposals, 6 kicks and 2 tackles during his debut match, he felt he played his role for the team, “just like [he’s] been playing in the Development League”. Of Indigenous heritage and making his first Senior appearance during NAIDOC Week, it couldn’t be more fitting for Karpany. Club Legend Jim Sullivan presented him with his first Senior guernsey prior to the match, which even featured a specially-designed print by Mandy Nicholson of the Wurundjeri people. Initially playing football with the Port Adelaide Magpies through the Port Adelaide Academy, Karpany was recruited to Coburg from the Northern Football League’s Fitzroy Stars. Recommended to the club by the Stars General Manager, Simon Minton-Connell after an injury-interrupted 2016 season, Karpany has slotted nicely into the Lions side. And despite missing out on playing Senior footy up in Port Adelaide, the move from NFL to VFL wasn’t that different for him. “I didn’t find the transition (from Adelaide to Melbourne) too hard because I have family here, and same with football because I previously played in the SANFL with Port Adelaide,” Karpany said of some of the changes in his life during the past two years. Developing a reputation for his strong tackling throughout his junior football career, he is focussed on improving this skill even more this season. “I’ve been working on my defensive pressure a lot, trying to aim for 5-8 tackles a game.” he said. Also possessing considerable pace and skill, Karpany believes if he “keeps playing [his] role for the team”, then “thinks [he] can hold [his] spot in the Seniors”. Coburg General Manager Sebastian Spagnuolo also applauded Karpany on his debut, stating it was “fantastic to see”. “Rivva has terrific skill, ability to take the game on, and applies good pressure as a small forward; we caught glimpses of all of those characteristics on Saturday.” The GM said. “We’re very proud of Rivva, and we’re sure that he’ll take great confidence from his game on the weekend.” Spagnuolo continued. Congratulations to Rivva Karpany, and Hear the Lions Roar!